You are here: Home / The Good, the True & the Beautiful / Political / Tell Chevron: Protecting the planet isn’t a crime! 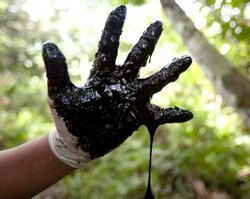 Tell Chevron: Protecting the planet isn’t a crime! To avoid paying for its destruction of the Ecuadorian Amazon, Chevron has twisted a U.S. law to attack the people who have stood up against it. Shockingly, a judge has sided with Chevron, ruling against the people who have worked tirelessly to bring it to justice. This is outrageous! I just took action to stand with the people of Ecuador and send a message to Chevron: Protecting the planet is not a crime. Please take 30 seconds to join me and sign the pledge!